I don't know about you, but to me the Orange Chicken from Panda Express at the mall is pretty much the best tasting stuff in the world. I think I've even had dreams about it. But. Now that we are gluten free it's just not possible to eat it anymore and the frozen variety they sell at the grocery store is still gluten-city. So I needed to find a way to make it from scratch at home without the gluten or scary chemicals. I was talking to my grandma the other day, and she mentioned that my brother had brought her and grandpa orange chicken from Panda Express. and that was it. I needed some. I've made lemon chicken a few times in the slow cooker, and was impressed with the results. I tested out the same recipe with orange juice instead of lemonade, and guess what? Instant orange sauce, without ingesting tons of deep-fried grease or a drop of gluten. Use a 4 quart slow cooker for best results. Dredge the chicken pieces with the flour, and shake off the excess. Go ahead and throw away any remaining flour, we won't need it. Heat olive oil in a large skillet on the stove and brown the chicken on all sides. There is no need to fully cook it, just sear it enough for the flour to stick and get a nice coating. Plop the chicken pieces into your slow cooker. In a small mixing bowl, combine the orange juice concentrate, brown sugar, balsamic vinegar, salt, and ketchup. If you'd like the chicken to be a bit sweeter, add a touch more sugar. Pour sauce mixture evenly over the chicken, and toss gingerly to coat. Cover and cook on low for 6 hours, or on high for 3 to 4. Delicious. All four of us had seconds. Like I did with the lemon chicken, I sprinkled some red pepper flakes onto my portion, because I like a bit of heat. Everyone else at the table ate it as-is, and was quite happy. and the rest of the list, is here. Enjoy!! This sounds so yummy. My family loves orange chicken so I'll definately have to give this a try this weekend if not before. YUM! My kids LOVE orange chicken! I will definately try this out!! I LOVE my slow cooker receipes :) Thanks!! Thank you for this and the links to the other dishes! Looking forward to a Chinese meal that isn't dry!!! I can't WAIT to try this next week! Take-out orange chicken is something my kids like, and I've been looking for slow cooker meals that the kids will actually eat for karate night. Thank you so much! Oh yum. We'll be trying this soon. Do you know of a dairy free (I think it's dairy - can't remember which of our forbidden allergens Pamela's contains) flour that would work? Think plain rice flour would be OK? Would this work with regular OJ? My mom left half a carton here and I'd love to use it up as we don't drink it! Thanks!! Ooh, this sounds good! I'm making this tomorrow! Do you think it would be okay to brown the chicken the night before and then put it on the next morning. Would you have to cook it all the way through? I love slow cooking, especially after a long day when you're tempted to grab something on the way home, but you don't have to because dinner's already done. I just don't really have time for too much prep in the mornings (don't judge... I need that extra 5 minutes of sleep). I love your blog and check it religiously for new recipes. I also pimp it out any time I hear questions about GF or slowcooking in general. Holy cow, we are making this tomorrow. Thank you so much for continuing to post even though you have so much going on! I did this after I tried your yummy lemon chicken...success! Infant B., yes, I do think rice flour or cornstarch would work just fine. The flour is just to coat the chicken to help provide a bit of a crust when browned, and to thicken the sauce a bit. Cooking Like a Frugalite, the food will cook just fine, but the sauce might not be as orange-y. If you have orange zest in the house you might want to add some after you give a taste-test to the sauce. Jacquelyn, yay! thanks so much for letting me know. My love of Orange Chicken is only deminished by how much I hate to fry things. This solves that problem. Thanks!!! YUM! Looks incredible. Thanks for adapating! This is a MUST try for my family. Thank you! I too love lemon chicken and sesame chicken *out* but whoa, the fat/grease is so over the top I just can't justify buying or eating it. So happy to have been directed to your blog by a friend. I was in need of some good crock pot recipes and she told me how great your recipes were on your blog. Can't wait to try some of them!! Thats so wierd that you posted this one. I made the lemon chicken a few weeks ago and had the same thought. Love it. This sounds great! So does your lemon chicken! I'll try both! ;) Thanks! My family LOVES orange chicken, so I have GOT to try this recipe out soon. Thanks for giving us another easy and tasty dish! when is my cookbook supposed to ship. do you know? i ordered it months ago. and i'm so excited!!! Ooooh one of my favorite dishes of all time! Thanks for posting! Are you getting so excited (*squeeeeeal!! *) for the release of your book!? I can't tell you how excited I am to make this!! I LOVE orange chicken and have yet to find a recipe that really tastes good. I love, love, love the lemon chicken so I am so looking forward to this. I'm making this tomorrow instead of stir fry, I'll let you know how it turns out. Thanks! Thank you! I love how tasty and easy your recipes are, orange chicken is right up my alley. By the way congratulations on your new book, I hope to pick one up soon. OH MY GOODNESS!!! I made this tonight and it is beyond good. We love orange chicken, but I stay away from Chinese restaurants/fast food because MSG gives me migraines. But forget Chinese restaurants now that I have this recipe. Thank you thank you! Now I'm totally craving Panda Express. I can't wait to try this. Do you have any recommendations, if all I have is a larger slower (I think it's 5.5 quarts)? Would it be best to increase the amount of chicken and sauce? Or make it as is and reduce the cooking time? This recipe looks so good. I will be trying it soon. This is SO going on my meal plan for next week. Thank you so much. 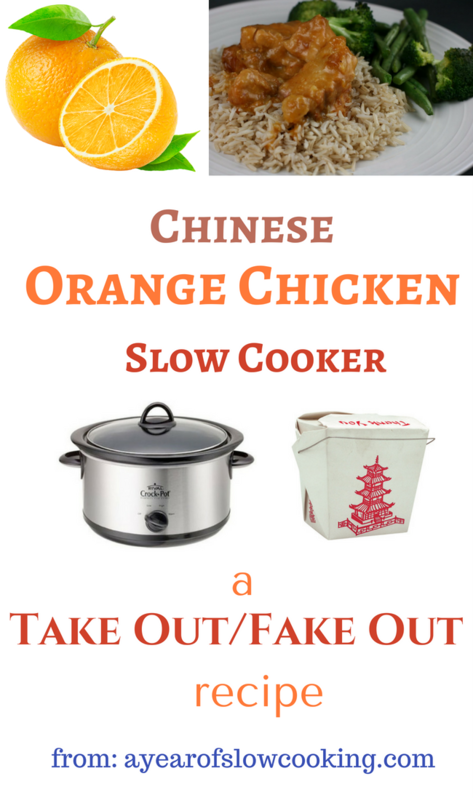 I love Orange Chicken and have been looking for a really great slow cooker version!! Thanks!!!!!!!!!!!!!!!!! I am totally going to buy your book, so I can reach for it instead of logging on for the Jamaican Jerk salmon recipe (it's in there, right?) We LOVE that one, with chicken, too. My GF son would gladly trade his little brother for some Panda Express orange chicken. He will be ecstatic when I make this recipe for him. I've had success with all of your recipes...to the point that my kids talk about the "Crockpot Lady" like you live next door. Thanks as always! This sounds awesome! I can't wait to try it. How crucial is that balsamic vinegar? What's it for? This sounds incredible. Can't wait to try it. This was so good - I felt warm and fuzzy just smelling it cooking away...! Definitely satisfies take out cravings. Loved mine with the red pepper flakes. I made this tonight and it was absolutely wonderful. My husband went back for seconds. I will be making this many times again in the future. Thank You for a great recipe. Yummy! This was DELICIOUS! I like orange (and lemon) chicken but I never order it in most restaurants because it seems you always end up with a plate of fried chicken fat and parts and it is so heavy and...well, fried. This was perfect and my family ate it up, asked for seconds, and licked their plates clean. I used a larger crock and cooked it for a little less time. It came out marvelously. Do you think this would work with tofu? the sauce will work just fine with tofu. WHen I slow cook tofu, I like to shake it in some cornstarch first, then fry in butter until it's got a nice crisp on it. Then slow cook on low for about 3 hours. Tofu doesn't take long to cook. here are some other slow cooker tofu recipes I've done on the site. I tried this the other night, but used regular OJ. You are right, it wasn't very strong on the orangey flavor, but it was still super good and really easy. Thanks for all your recipes!!! I've got a really good recipe for crock pot apple butter that I thought you might like. This looks really good! I love the take-out orange chicken, but have been increasingly concerned about the poor quality (and questionable sources) of the meat. Thanks so much for posting this recipe. Stephanie-Can you come up with a reliable recipe for crock pot brown rice, please? It takes so much longer to cook; it would be very nice to just have it simmer along with the "fake out take out" recipes!! Thanks...You're the coolest, and have revived my crock pot cooking to even cooking for a grad student son, and soldiers going and coming from Iraq and Afghanistan. With the meal in the crock pot, you can really enjoy your company, plus send home a takeout box, as there's enough for everyone!! Thank you!! well, i made it THAT night, my hubby really liked it , i think i will add more sugar next time as it was bitter ... and I'm thinking adding a bit of honey too?? Looks delicious! I got all the ingredients today and I'm making it tomorrow! I made this last night and it did taste exceptional, but it started to burn around the edges just an hour into cooking. I have long thought my crock runs hot so from the start I add an extra 1/2 cup of water. Any other thoughts? If you truly think that it's the pot, then please contact the manufacturer directly. They all have 800 numbers and websites----and will give you a water test to check the temperature. I saw that you recommend a 4 qt. but would it work the same to double the recipe and cook it in a 6 qt? That look amazing. I must try it. If you have a 6 qt, the doubled recipe should fit just fine. You can also put a layer of foil down near the food to trap steam and heat and then put the lid on like normal. This was very good. Glad that it was ready when we came home from dance. I looking forward in getting your cookbook. Made it tonight and it was so easy and delish! I am cleaning out my crockpot to start another batch to take to work tomorrow!! Do you think it's ok to throw in some carrots, onion and red pepper the last 30?? Just wanted to add a few veggies! Do not sub out the OJ with orange marmelade. It didn't turn out so good. I was trying to be thrifty and use what I had. JaneAnn, you can certainly add veggies. If they're only in for 30 min, they will still be quite crunchy. An hour or so might be a better bet. Asher's Mom, oh no! I'm so sorry. I hate it when things don't work the way I want them to. 1. I added a jalapeno to spice it up a bit...but I left it whole aka no spice....if you add one, cut it up or split open. 2. I added the entire oj (120z) because I was skeptical of the 6oz when I saw it in the crockpot. Big mistake...it tasted good...but was too bitter and overpowered. Stick with the recipe exactly. My DH is gonna be so happy when I tell him about this. That is his favorite takeout meal along with General Tso's chicken. Thanks so much for posting this up for us to try! My goodness this looks amazing! My family will be so happy...they love orange chicken! I finally broke down and bought some frozen orange chicken, but the cost is big for such small portions and I don't even want to know what they make it from! This one's definitely going in the rotation! I had considered orange chicken in this very manner after I had such success with your AWESOME lemon chicken recipe, but you beat me to it! Thanks for test-driving it. I look forward to trying it myself. And I can't wait for your book... Christmas in October!!! I made it the easy cheaters way with frozen foods I had stashed. Breaded chicken nuggets (20), stirfry veg (2 cups). Not only did it taste really good, but I have leftover "stayin." Made MY mouth happy! I want to make this tonight but just realized I have no balsalmic vinegar. Does anyone know of any good subsitutes? I do have red wine vinegar. You can use any vinegar for any other, with just slight taste variances. I made a double recipe of this tonight, and The Orange Chicken was a BIG hit!! Quite delicious! I also attempted and successfully made Brown Rice in the crock pot today. I did heat the broth first (you could use water), and then stirred in the rice, let it cook on high about 2 hours, came to check on it, and it was perfect fluffy brown rice. Yum! For measurements, I used 1 quart of Thai curry broth, 2 15 oz. cans of garlic flavored chicken broth, and a cup of water, all heated and placed in crock. I then stirred in a 1# 12 oz. package of brown rice, and stirred, then walked away from it. In 2 hours, it was perfect brown rice. It could not have been easier. You could use all water for the broth in the rice. It would take about 9 cups of water for that package of brown rice, and don't forget to toss in a bit of salt. I purposely made extras pf the rice to go in DH's lunch...I make ahead a 5# package of ground turkey into taco meat, let it cool a bit, then spoon by 1/3 cup fulls into quart freezer bags, squeeze out all the air until they are straight little bricks and freeze. For his lunch, I smear a large tortilla with refried beans, sprinkle on a bit of rice, sprinkle on some grated cheese, add a frozen taco stick, and wrap it all up, using wax paper to put around the burrito. With the wax paper, DH can then microwave his treat at work, and re-heat if he gets too buy to eat right then! Oh, I didn't have any oj, nor balsamic vinegar. So, I instead used frozen lemonade, and apple cider vinegar. Worked well! Now, I have OJ and Balsamic MIST spray in the house, and I'm doing the "real" recipe! oops, I accidentally deleted my comment! GA Mom, Thank you so much for figuring out the math on the brown rice! Rice freezes so well, too. This is wonderful. I'm excited to test it out. I made this last night. It was starting to burn, so I tried the foil trick and that seemed to help. My husband even liked the burned part. I forgot to put in the salt, so I added a bit at the end (maybe 1/2 to 1 teaspoon) and it was fine. Ok I tried this and it smelled amazing when I was mixing it, but then it burned beyond the point where we could even eat it. I have a regular old, white Rival crockpot and left it on low for 5 hours when I found it burned. I have this problem a low with this crock pot. Is there something I can do to help it not burn? Unless something has a lot of liquid in it, it always burns in my crockpot. Help please! I think your slow cooker is too big for the amount of food you routinely put in it. That's okay, you just need to put down a layer of foil near the food to trap in steam or moisture, or insert an oven-safe dish into the crock to create a smaller cooking vessel. It is in my crockpot now! I can NOT wait to taste it!! :) Orange chicken in my weakness, my guilty pleasure. I will post an update after it is done!!! I put red pepper flakes into the flour so the heat wasn't too concentrated and..wow! I will def. be making this again! FANTASTIC! Got a big thumbs up from my husband. I can't wait to try the tofu...any recs of adapting to beef and shrimp? My husband loves orange______ whenever we go out for Chinese, so this is going to save us a lot of money! Hi AJ, I'm so glad you enjoyed this! the beef should cook the same way as the chicken, but for shrimp, it'd be best to not cook it very long. Shrimp doesn't take very long to cook, I'd check it after about 1-2 hours, depending on whether or not it's fresh or frozen. I tried this last night. I had the same problem with it cooking too fast. My crockpot must be more than four quarts. I and my DB thought this was a great dish. Next time I will double it, so I can take some for lunch. Thanks for the recipe. It's going in my rotation. Maybe it's just us, but it was REALLY orange flavored. I think that if I did this again, I'd use regular orange juice or half the amount of concentrate and some water to make up the different. We needed lots of rice to tone down the flavor. This is the first recipe of yours I have tried, and it was DELICIOUS! I love orange chicken, but like others have said, it's either very fattening take-out, or questionable frozen food. Definitely making this one again, and can't wait to try your other recipes! I made this last night for dinner. It was delicious and still great today! Thanks for all the awesome recipes! hi, I just found the link to your blog from Mommy's Kitchen for the cheesy potato & ham casserole. This looks great, I'm going to have to get my crock pot a permanent place on the counter with all these great ideas! Yum! I just had the orange chicken at Panda Express the other night. I will have to try this! Maybe it's just me (based on all the great comments) but this tasted WAY too orangy for me. I used 1/2 the can of concentrate but if I made it again I'd use just a tablespoon or use regular orange juice and some orange zest. It tasted like orange juice concentrate in a bowl. I used almost 2 lbs of chicken too. I just made this today & it was tasty! Thanks! Ok, I'm new to using a slow cooker... Do I need to add water to this recipe? Do you mention in your recipes if water is needed or is it just standard to add water? Thanks! no need to add any water. I've put in the proper moisture in each recipe. Oh. My. Gosh. I made this for dinner tonight. It was AWESOME!!!! And easy! I will be making it AGAIN! I made just as is in the recipe - I have kosher salt so I was good there, too. FABULOUS! I wouldn't change a thing. I have this in the crock pot right now! I hope mine tastes as good as it smells. I'm going to try your chicken nugget recipe tomorrow for my daughter. I made this the other night and it was good! I added some of those frozen Trader Joe's green beans about 20 min before we were going to eat (because I was too busy to cook them separately as I originally planned) and it was convenient, but I think maybe they altered the sauce taste a bit. I used heaping tablespoons of brown sugar and thought maybe I should have added more to make it sweeter, but I also think we are too accustomed to the sweet Panda Express sauce. I am not much of a cook. I came across this recipe via someone on a message board who has made many of your recipes. I just put it in my crock pot and I tried the sauce that was left in the bowl I mixed it in...wow! I'm pretty sure this is going to become a favorite! It's soooo simple and easy, even a non-cook like me could handle it! I love this site. I did however use more chicken and ended up doubling up on the sauce and I hope that doesn't mess anything up. But I can't wait to try this. I'm 8 months pregnant and chinese good has been a huge craving! Hi! Just made this last night and MY was it orangey! I noticed someone else commented on the orangey-ness and after thinking about it, I decided that next time I will cut the orange in half and add some soy, garlic and make the red pepper flakes a requirement. That being said, I totally dig your site and have been pointing friends to it for the past year! The cookbook's on my Christmas list! I made this and it was great. However, I have a 3 quart cooker and the recipe said 4 quart, so I cut everything by 1/3 and made it. Actually, the full recipe would have fit in the 3 quart. I'm having a few people over on Saturday. I might make this again, full recipe this time!! Still getting you book for x-Mas!!! this was so yummy. I am so happy to have a new recipe that is fast and easy for my bag of tricks and the kids loved it too. I just found your blog and it looks so yummy! I can't wait to try some of these. I saw someone said that using OJ didn't give them great results, but I live overseas and frozen OJ concentrate is not readily available. Do you think if I added some orange zest it would help in using the OJ and not a concentrate? I am so sad! I have a 5 - 6.5 SC. I tried this recipe and did the foil thing, I even put two layers of foil. I had to go out, and when I came back 5 hours later it was burned around the edges and it totally messed up the flavor. I will try the smaller oven safe dish next time. I really want to be able to make orange chicken at home! I was directed to your site by my SIL and found this recipe to try out in my new slow cooker. It was easy to make, but I found the sauce much more ketchupy than orangey and the chicken was DRY! Next time I think I'll make a marinade with the orange concentrate, garlic and soy sauce and marinate the chicken overnight to tenderize it. Then I'll strain the sauce and add the rest of the ingredients and fry the chicken. Or I'll try it with chicken thighs. Will have a look through the other recipes on your site - hopefully I'll have better luck next time! I made this last night. It was amazing. Its one of the few things my husband and I both love. Thank you so much for your recipe! My son is severly allergic to sesame and so we do not get asian food very often. I made it for Valentines day and it was like we were eating out! I whipped this up and served it over mashed potatoes and it was FANTASTIC. I was really excited to try this recipe, but it did not turn out. I have not used a slow cooker very often so maybe I did something wrong. The stuff in the cooker looked like mush. All of the breading came off the chicken and soaked into the sauce. My husband thought it tasted good, it just did not look good! What did I do wrong? OMG!! Soooo yummy! I was given your website by a co-worker and started surfing around it yesterday. I am so excited to try these recipes, the first one I picked was the orange chicken because it's my husbands absolute favorite when we go to Panda Express and I'm always looking for a recipe I can duplicate at home. We all loved it, the only thing that I'm going to add is more red pepper flake during the cooking, I like a little more heat than the rest of the family so I just added a tad in the beginning, but you couldn't even taste it when it was done, so I'll be upping that amount a bit, but even though it didn't have the kick that I crave, it was wonderful and there's enough for both my husband and I to take to work for lunch tomorrow, even after feeding our family of 5 tonight. Love it! This was SOOOOOOOO good!!!!! Thanks a bunch! Next time I'll try lemon chicken. And maybe with some red pepper flakes for some kick. Yum, yum, yum!!! (We served with Jasmine rice). This was REALLY good! Thanks for the recipe!! Now this is lovely! I can't wait to make this one. I find it quite easy and fast for me. Hi, I noticed in the picture it's pancake mix but in your ingredients it just says flour? Wondering which one to use or does it matter? we're a gluten free family, and I use Pamela's Baking Mix (a gluten free mix) as my all-purpose flour. If you aren't gluten free, go ahead and use a regular AP flour. I've made this a dozen times. Super easy and really good. I've read a lot of comments on here about the chicken turning out dry and the sauce being burnt. if that's the case then cook it for a shorter period. I've had the same problems and I only cook mine for 4 hours on low. 6 hours it turns out dry and burnt, its still good but not as good. I use 2 breasts and I have a 6qt slow cooker, that's way too big for this I know but that's all I have. Not sure if I burnt the sauce or what, but mine was not so great. The chicken was nice and tender, which was good, but comparing it to regular fried orange chicken it did not do so well in my book. I tossed the leftovers unfortunately. But luckily I had a pot of chili in my other crock pot for meals for the rest of the week! This was great. I am gluten free and was searching for a way to use up some chicken breasts that I had in my freezer. I made this today and my whole family (not gluten free) enjoyed it! Even my Dad who does not like Chinese food was pleased. Easy and tastes great! Hi Stephanie, I love your site! I'm wondering if it will make a big difference if I used Apple Cider vinegar instead of the balsamic vinegar? I loved the orange chicken. I am hoping to try this with beef soon! I found this recipe to be quite good. I modified it a little bit. I used bitter orange marinade in loo of the OJ and I did not flour my chicken. I did put the sauce into a simmering pot once it was cooked and added a wee bit of cornstarch to thicken it up and served it all over a bed of fried rice. FANTASTIC. I made this, following the directions ver batik, and we fought over the leftovers! So delicious, and so much better for you than take-out. Thank you! I was craving a recipe like this so today I googled "slow cooker orange chicken" and your blog and recipe came up. It sounded amazing! I just tasted what had been slow cooking all day and it's so bitter. It smells and looks great but it's like the orange juice went bad or something. Did I do something wrong? It was pulp free concentrate btw. Last night the kids asked when I would make the orange chicken again. Well, I made it today and I think we enjoyed it more this time. I think it is going to be a regular. My family loves Chinese food but my husband is diabetic. This is a great make at home recipe that satisfies everyone. New to gluten free cooking. I cook for another family once a week that's gluten free. I have some rice flour I bought for something else, would that work to coat the chicken in instead of buying Pamela's? Thanks! Yes. Absolutely you can use the rice flour. I use Pamela's for cup to cup translation in regular recipes (baking, mostly) because it has baking soda and xanthum gum in it, which helps with rising and binding. It has almond meal in it----if you do use it for baking for the family, make sure they are okay with tree nuts. I am going to make this for dinner tonight, but I only have a 2.5 quart or a 5 quart crockpot. Does anyone have any suggestions on how to cook this recipe in one of these? Jenny-I've doubled the recipe, and it fit in my 7 quart crock pot just fine. If your crock isn't full, the food will cook (or heaven forbid....burn! ), so check it often. This recipe is really worth the effort, and a real treat!! i was wondering how many servings this makes? I doubled this recipe and made it tonight with some basmati rice, and it was a huge hit. It was delicious, not too terrible for you, kid's liked it and it was waaay cheaper than takeout fore the whole family. Thanks for the recipe! I am not sure what I did wrong, but I was so disappointed in myself. :( I'm not a very good cook so I'm not sure what went wrong. After an hour in the crock pot (on high) it was starting to burn so I turned it to low. About four hours later, it was still burning really badly and most of the chicken was literally turning to shreds (I'm assuming I cut the pieces too small). The saved pieces just tasted dry and like orange juice concentrate. I do have a big crockpot (not exactly sure how big, but I'm guessing between 4-5 quarts) so that might also have played a part in it...and I added about a tablespoon of honey to sweeten it even more. Perhaps that thickened it too much? The sauce tasted delicious before I poured it over the chicken, though! this is a great blog! First time to visit, will definitely check out the other recipes! Question tho -- is there a way for me to cook this orange chicken (or any other recipe)in 11 hours instead of 6? (11 hours is my 9-hour work + daily commute...) i have scoured the web, and the longer-hour recipes are quite limited to pulled pork etc. Thanks! I hope this helps a bit. If you have other questions go ahead and email or find me on facebook. 2. While the idea is pretty great, I'm sad to say that it just sort of tastes like chicken soaked in orange juice. Really sweet orange juice that is...any suggestions? Thanks so much! Excited to continue to start trying all your other recipes! My wife had cut up some chicken into cubes and already lightly browned them in the skillet to make a persian tomato meal we always make when I came up with the idea to make orange chicken as we've once done before. I looked up recipes when this one caught my eye. It seemed different than all the others in that there wasn't any deep frying, oil, or heavy breading. It was easy; set it and forget it. Came back 3 hours later and dinner was served! Nice orange taste-not as bad as others here mentioned. Although I would probably use 1/4 can instead of 1/2 and add some soy sauce next time. After all how can you make a chinese dish like orange chicken without soy sauce? All in all, it was very tasty ('lick the plate' good) and we'll definitely make it again. Thanks! I found this blog and recipe recently during a Google search. I regularly use my slow cooker with great success, but this did not turn out. ..wasn't edible. My hubby and I were both at work for the 6 hours cooking time, and when we came home the entire contents of the pot were burnt : ( I will definitely try this again though because of all the rave reviews, but I am thinking 2 to 3 hours on low is all the time required to cook the meal, otherwise I am sure another option would be to bake it in the oven. I was hoping to add some frozen broccoli and maybe some pineapple chunks. Do you think that'd be good? And when do you think would be a good time to add the broccoli and pineapple, only the broccoli's frozen. :) Thank you! Hi Ashley, I would recommend running the frozen broccoli package under hot water to mostly thaw it, then add it to the pot, taking care to not dribble in lots of liquid from the packaging. I'd think the broccoli would be heated through in about an hour, and would add it to the last hour of cooking time, and that's a good time for the drained pineapple chunks, too! i know this is re-run, and i've made it with great results exactly as written. now i have a big package of chicken thighs WITH BONES and i'd like to use those. what do you think? would it work? does it need more time? thanks for the prompt answer. if i double the recipe, can i freeze half? or is that asking altogether too much? Hi Barbara, I don't see why not!